It’s been talked about quite a bit in recent years, and critics have always found a way to disregard Oregon’s accomplishments. Sure, as far as overall team success is concerned, the Ducks have been one of the most successful college football programs in the nation since 2009, but their inability to win a national championship has led to skepticism. 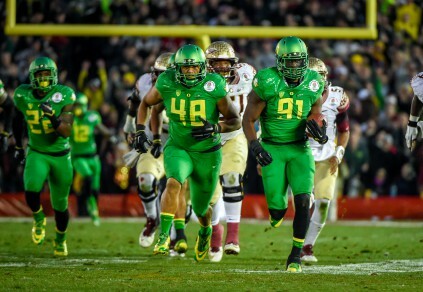 Some claim that Oregon’s style of football, which includes speed and misdirection, is not good enough to compete against bigger and more physical teams. Others have said that the Ducks are more worried about making a fashion statement than winning a big game. Despite the criticism, Oregon has always found a way to remain competitive, and even though the Ducks have come up short in the last few years, this could be the season in which Oregon makes believers out of everyone. Although the Ducks scored 59 points and accumulated 641 total yards of offense, which are both Rose Bowl records, Oregon’s so called “soft” defense was the major difference in the game. Despite the absence of Oregon’s All-American cornerback Ifo Ekpre-Olomu, the Ducks tenaciously covered Florida State’s receivers and the pass rush combination of Tony Washington, Derrick Malone and DeForest Buckner made life difficult for Jameis Winston. In the end, Oregon forced four fumbles and an interception and capitalized by scoring 34 points off turnovers which ultimately led to a convincing 59-20 triumph over the Seminoles. While the stats may tell some of the story, Oregon Ducks’ head coach Mark Helfrich looked at the victory from a different perspective. ”Well, we just tried to out-team them,” he said after the game. That’s been Oregon’s motto all season long. The sense of togetherness and brotherhood has kept these highflying Ducks on the same page, despite being decimated by injuries. It’s not over yet, however, since Oregon still has one more game left on the schedule. 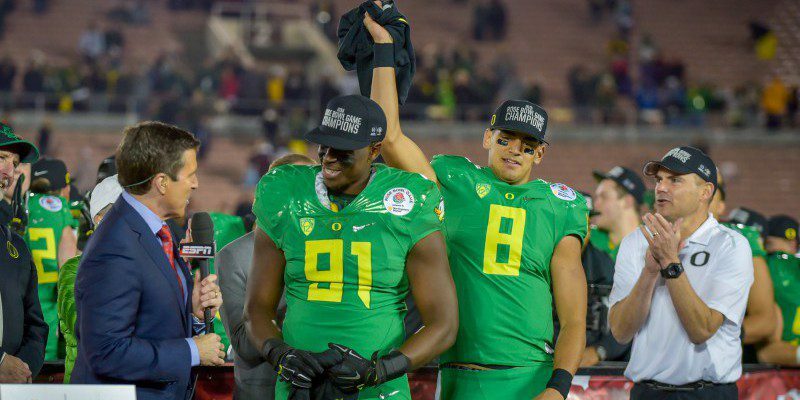 The Ducks haven’t played in the national championship game since 2011, but on January 12th that will change. Oregon is back and it’s ready.